Front Rim 3.75 x 17"
The third 588cc rotary engined Norton race bike, used for the factory teams final two seasons of 92 and 93. The NRS588 replaced the still competitive RCW588 which had been used for the three preceding seasons. Brian Crighton, a former road racer and motorcycle dealer, originally joined Nortons in 1984 and worked in the service department before moving on to research and development. As a former competitor he quickly realised the enormous potential of the rotary. I wanted to go racing. But no one wanted to know. I was convinced that I could up the power from the 92 the best engines were giving to around 120 and eventually it was agreed that I could work on a racer provided I did so in my own time and at my own expense - working evenings and weekends. He let me have the kitchen in the caretaker's house as a race and we finally split up. This meant that we had a bike spare for the final round at Brands Hatch and I invited Steve to try it. He'd never ridden the rotary before and it wasn't set up for him but when I asked him after practising if he wanted us to change anything he said everything was fine just fill it up with petrol! He then went out and won the race. A fabulous performance. This late run of successes literally transformed the British racing scene. Fans at last had something to cheer about and this, coupled with television exposure, led to John Player stepping in with major sponsorship for the 1989 season. 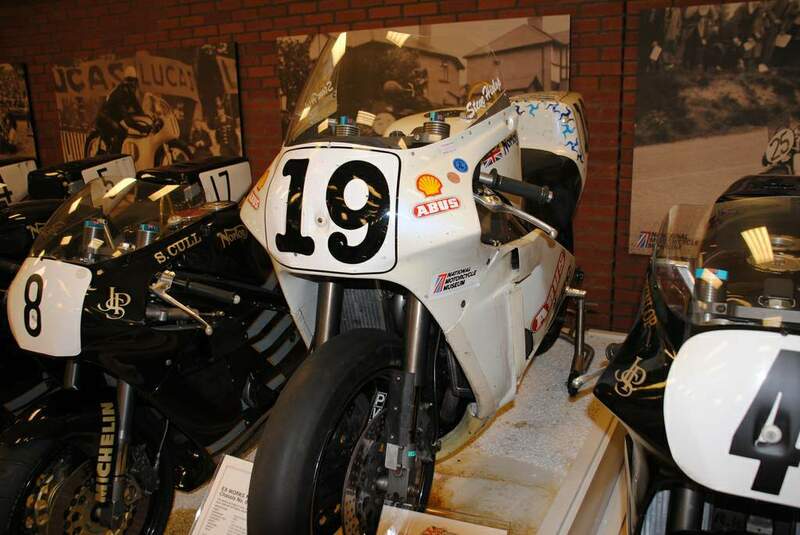 The riders for 1989 were Nation and Spray and both the riders and the bikes were finished in the black, silver and gold colours adopted by John Player during their Formula One car-racing days. Additional staff were signed on and Nick Coll is appointed team manager, leaving Crighton free to concentrate on technical matters. The first major change was to abandon the air-cooled RC588 in favour of the water-cooled RCW588. Again the TT results were disappointing. In the Isle of Man, Nation teamed with Ireland's Steve Cull (Spray prefers not to ride in the TT) and both retired from the TT Formula One Race - Nation when he ran out of petrol and Cull when the gearbox failed. In the final race of the week, the Senior TT, Nation was in fifth place on the fifth lap when the water pump failed, while the chain of Cull's bike broke when he was holding eighth place with just three miles to go. He pushed home to finish 23rd, and got a great ovation from the partisan crowd. Following the pattern of the preceding year, the Norton team really came to the fore after the TT. Roland Brown puts it well in his review of the British season for Moiocouru. The story of British Racing in 1989 was undoubtedly the return to victory of the Norton. Riding an all-black JPS sponsored rotary (hat fully lived up to its promise of the season before, Steve Spray roared to win after win to take two major championships amid much patriotic programme waving. The two championships were the British 750 cc TT Formula One and the MCN/ACU British Championship, and during the season Spray set no less than nine new lap records at British short circuits. On the surface all was well, but behind the scenes the team was split by internal politics and petty squabbles. Unable to keep the peace and to get the team all pulling together, team manager Collis left at the end of 1989 and was replaced by former Honda Britain team chief Barry Symmons. The FI sports roadster was launched at the National Exhibition Centre, Birmingham in November 1989 with a price tag of over £12,000! A handsome machine, finished in John Player racing colours, it was powered by an RCW588-typc engine which produced 95 bhp at 9500 rpm with a compression ratio of only 9 to 1. The 1989 racing engines gave between 145 and 148 bhp at 10,000 and were not critical on fuel. In fact the) would run on two-star. We actually used normal pump four-star and did not have to worry about the very high octane special fuels that the rival teams now use. For the team 1990 began well with Robert Dunlop, signed to team with Nation at the TT, winning the big class at the North West 200 where he went through the radar speed trap at an incredible 189 mph - almost 20 mph faster than the best of the Japanese four-cylinder machines! At the TT Dunlop and Nation finished third and sixth in the opening Formula One race after Dunlop had set the fourth-fastest lap around the island during practice at 119.74 mph and Nation had overcome the handicap of rib injuries sustained at Snetterton just before the TT. Then in the Senior Nation rode a well-judged race in poor conditions to finish second, beaten only by Honda hot-shot Qui Fogarty. Dunlop retired while holding fifth place when a stone jammed the throttle open. It was at the TT that news came through that the FIM had decided to scrap the handicap imposed on only to be excluded when the tank was measured and found to be 0.7 litre (just over a pint) over the 24 litre maximum. In lesser events the team had been doing well. Haslam had captained the British team to a resounding win in the annual UK versus USA Transatlantic series, winning two of the three races at Brands Hatch, while Nation and Dunlop had dominated the North West 200 in Ulster where Nation won the main event at an average of 120 mph and his Irish team-mate took the Super-bike event with Nation second. After the TT the riders switched to the new machines and when Haslam won on his debut on the NRS588 at Brands Hatch things looked to be going well as far as he was concerned - though Nation was not so happy. 'The bike had been developed by Ron and his likes and dislikes when it comes to setting up a bike are completely opposite to mine. I simply couldn't get on with the new machine and struggled for the rest of the season,* said Nation who left the squad at the end of 1991. A highlight for British fans was when Haslam took twelfth place in the British Grand Prix at Donington in August 1991 - competing against the full might of the Japanese teams with their V-four two-strokes. The FIM agreed to allow the 588 cc rotary to compete in the 500 cc class and Haslam rode his normal short circuit machine. Said the team chief Symmons: The idea was to show the flag and finish the race so Ron paced himself rather than racing flat out. Later the same day he went out on the same machine and won the MCN/TT Supcrbike round, lapping faster than he had done in the actual Grand Prix. At the time Haslam was favourite to take the MCN/ TT Championship but then a string of poor starts cost him vital points. In race after race the pack roared away while he struggled in mid-field. It made for incredibly exciting television as he carved his way through the field but cost him vital points as he was unable to score the outright wins needed for championship success. Haslam broke six lap records during these epic rides but could still finish only fourth in the main MCN/TT Superbike series - though he did climax with a flourish when he set a new lap record at 91.99 mph for the Brands Hatch short circuit at the final round of the year in October. In the lesser six-round Superbike Championship Haslam was second. The year ended with two notable happenings. First David Garside's patient development of the rotary engine was recognised with the award of the MBE and then John Player affirmed their intention to back the Norton racing project again in 1992 with Ron Haslam as number one, with support from Ireland's Robert Dunlop who will also carry the Norton colours in the TT. In contrast the Norton racing effort ended in a blaze of glory. The first really major success for the promising rotary-engined racer came at the 1992 Isle of Man TT when Steve n. . ; having a one-off factory ride on a factory bike with private (not John Player) sponsorship won an epic battle with Carl Fogarty (Yamaha) to take the senior TT at the record avarage speed of 121.28mph - the first TT win for Norton since 1973. And after John Player pulled out at the end of the 1992 season, during which Robert Dunlop finished second on a Norton the MCN Supercup series (Ron Haslam's hopes being dashed by a broken leg) Duckhams look over as the major sponsor for 1993 and 1994 with Colin Seeley as team manager and Brian Crighton as the technical brain. After a 'shakedown* season in 1993 during which Jim Moodie finished second in the British Supercup series the team dominated the 1994 championship which Ian Simpton won with 319 points to Moodie's (now on a Yamaha) 287, Phil Borley on the second Norton only three points behind him. 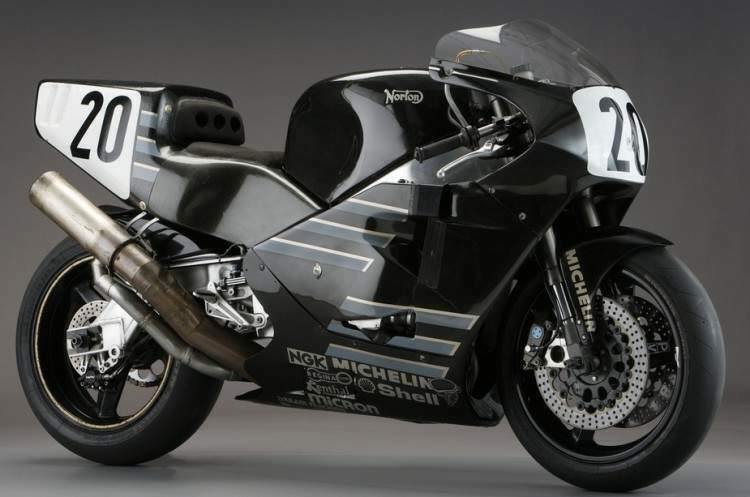 At the end of 1994 Seeley had to take stock The Norton racing effort was costing £200,000 a year and the team had scored 22 wins, 21 second places and ten thirds. We had some technical help from Norton* but we didn't get a word of thanks or congratulations from the Aquihms, so when Honda offered us a deal for 1995 we took it.' And that was the end of the Norton racing effort, the 190mph machine wheeled into retirement mil the fastest bikes in their class.